This lesson will describe how the clinic or patient can export a copy of all conversations to PDF. Go to www.myhealthware.com and log in to your myHEALTHware account. If you are a clinic representative and wish to download the clinics conversations, choose the clinic from the "You are acting as" drop down menu. If you are a patient, ensure your name is displayed. Click Export Conversations from the Actions panel. You will see a message explaining that the conversations are being processed for export. Once complete, the zipped file will be saved to your Downloads folder. Open/extract the zipped files. 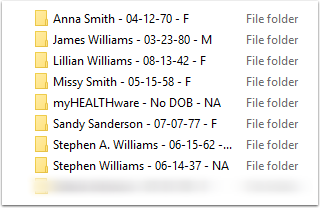 Conversations will be organized in an individual folder by patient as seen in the screenshot above.